Go to careers.asos.com or asos.com/careers to be landed on ASOS careers page on which you're presented with several ways to find a suitable job title. You may click JOBS AT ASOS or OUR BUSINESS AREAS at the navigation bar or scroll down to find a job title in the listed areas like internships, customer experience or technology. 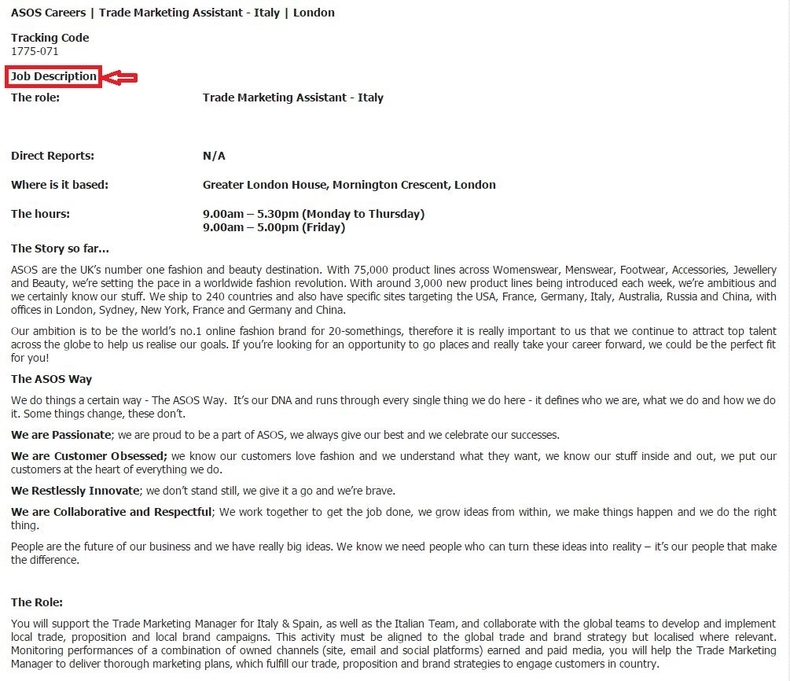 Or you may directly click the link at the bottom of the page to view current job opportunities at ASOS. Here we just choose the last way - click the link to see current job opportunities. 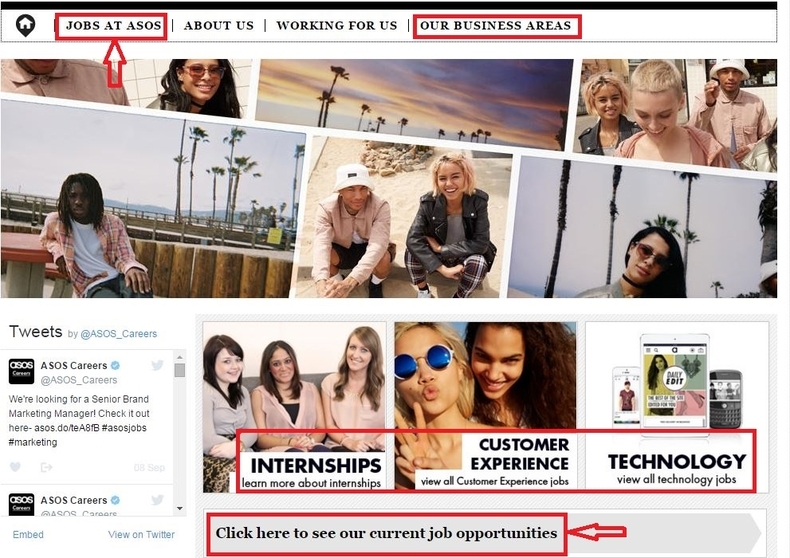 After you click to view current job opportunities, you're directed to the page below showing many results that reachable at ASOS. Just pick one that suits you and click the job title. 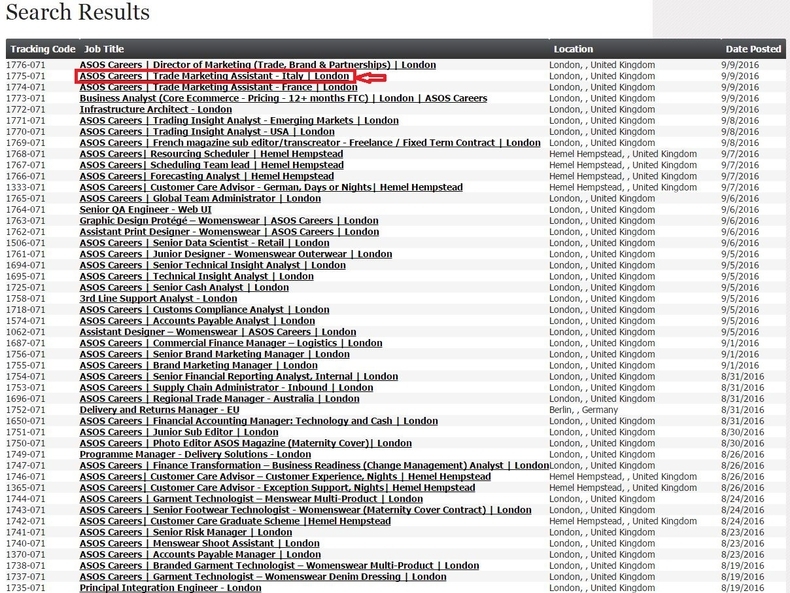 On the page below, you'll see the specific description of the job you want to apply for. Read it carefully and think about if the job is a good match for the direction you'd like to take your career in and if you possess the skills and experience required for the role. If you are quite sure and confident to get the job, just upload your new CV or using your existing CV to apply for the job. In this step, you're asked to complete your contact information in addition to the information your resume has provided. 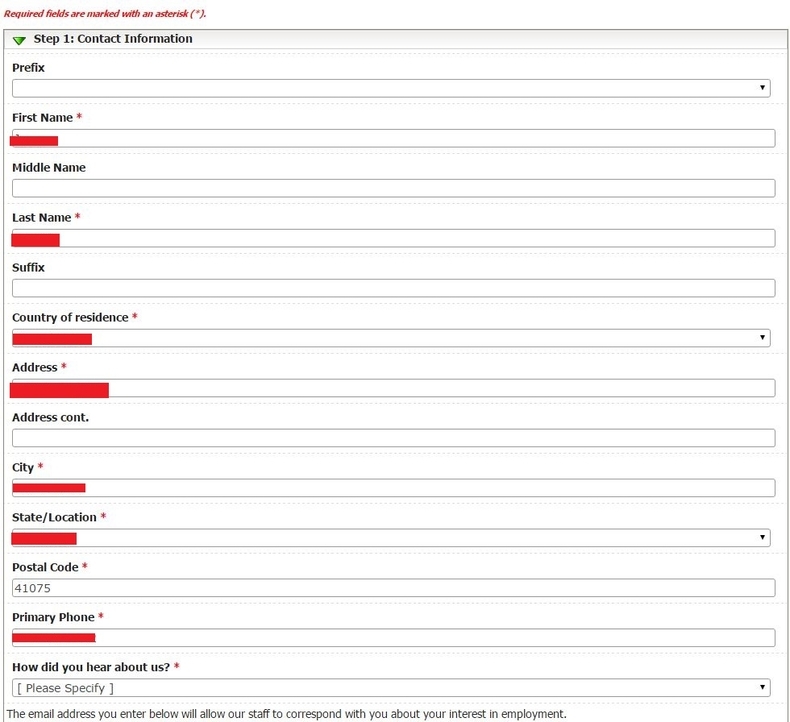 After all the required fields marked with an asterisk (*) are filled out, you may click "Continue" to move on. 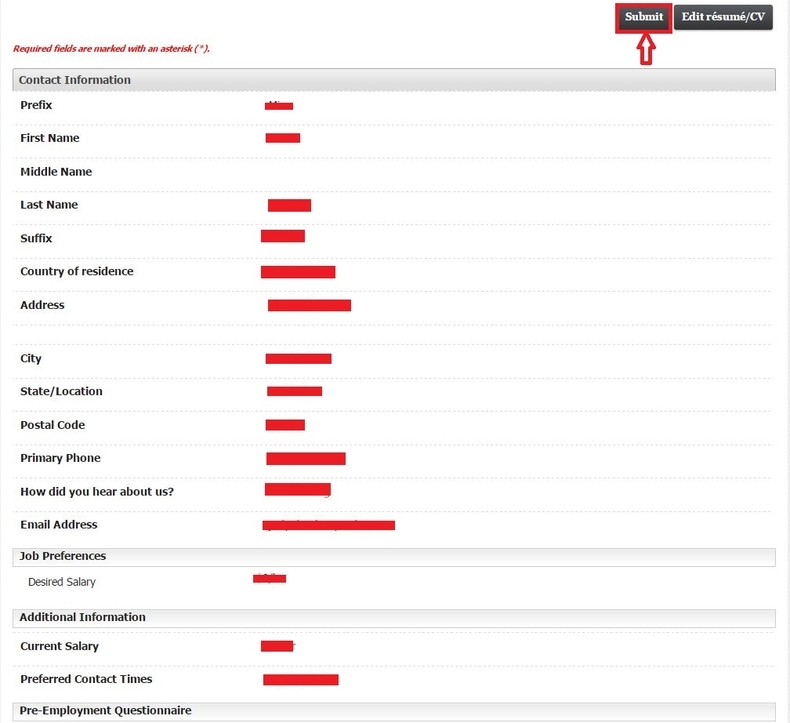 In this section, you are required to tell your job preferences like desired salary, preferred contact times and then fill out some additional information. Click "Upload File" to attach a cover letter or additional documentation and then answer some pre-employment questions like "Have you read and understood the job description and feel that you have all the skills and experience required for the role?" and "Are you aged 18 or over at the time of completing this application?" Afterwards, you can just review your resume/CV content to make sure all the required info are correctly provided. Step 7 asks you to review all the information you have provided in the last 6 steps. If you are quite sure all the required fields are correctly filled out, just click "Submit" at the right side or the bottom of the page to submit your ASOS online application. When you see the notes - Thank you for your submission ..., you've successfully submitted your ASOS online application. In order to successfully receive further communications regarding your submission, you need to adjust any email/spam filters to allow delivery from the specific domain. Click careers.asos.com to apply for ASOS jobs online.